We love Custom Printed Handle Shopping Bags! These bags are perfect for home décor shops, Cosmetic shops, market delis, shoes stores, art supply product shops and so much more. These bags can literally be used by any kind of business. The bags are durable but light weight with the handle giving added style to the bags presentation. 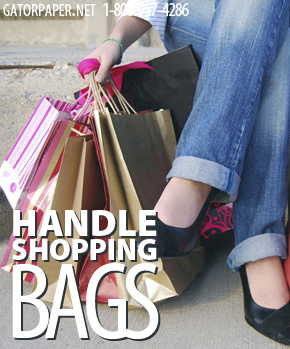 Gator Paper provides white and natural twisted handle shopping bags in a range of sizes. These bags have durability and a sleek look the customer will love. This printed shopping bag can turn into a reusable shopping bag by your customer. Your brand will be marketed over and over again by the customer reusing the bag while you save money on product order. Gator papers low prices and minimum ordering requirements make it a win win! Along with the custom printed shopping bags, Gator Paper has a full line of quality restaurant and business supply products. We offer everything from custom printed deli paper, freezer paper, butcher paper, French fry scoop cups, custom printed clear plastic cups, printed sandwich bags and so much more. Whatever your food service packaging needs Gator Paper can help you get what you need. Bags that are durable but light weight with the handle giving added style. Branded bags that have a sleek look the customer will love. Review our website for more information on our custom printing technology and color printing availability for the products you want. Our color printing team can review your logo for placement on each product.